I awoke and became annoyed when I discovered Mary forgot to pay the water bill. That was the extent of my problems September 11, 2001. 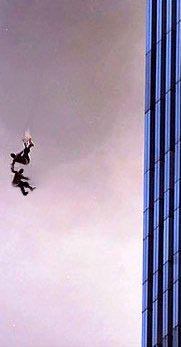 Meanwhile, many of my fellow Americans in the twin towers were faced with the unimaginable horror of deciding whether to leap to their deaths or be consumed by fire. Dear Lord. Ten years after 9/11 Mayor Bloomberg banned prayer from the New York 9/11 Memorial Ceremony. And yet, Bloomberg supports the building of a mosque at Ground Zero. The left supports Sharia Law while President Obama canceled the traditional National Day of Prayer at the White House for fear of offending Muslims. Remarkably, thanks to the grace of God and the efforts of George W. Bush, America has not suffered another terrorist attack. And yet, the Obama administration is still seeking to prosecute CIA heroes who helped to protect us. Terrorists caught on the battle field detained at Guantanamo Bay are treated with kid gloves; special concessions made out of respect for their religion, Islam, which includes meal choices from five menus, served at a specific temperature or thrown out and prepared again. Muslim detainees are given prayer beads, a prayer mat and a Quran which can not be touched by non-Muslims because we are considered infidels. Thus, a Muslim interpretor gives the detainees their sacred items. At Guantanamo, arrows painted on the floor pointing east informs detainees in which direction to pray. Meanwhile, three U.S. Navy Seals are facing court marital for allegedly giving a terrorist a fat lip. Clearly, ten years after the horrific 9/11 attacks, America has two enemies seeking her destruction; Al-Qaeda and the American left who reside mostly in the Democratic Party lead by Barack Husein Obama. To save America, BOTH must be defeated. The Bible documents on numerous occasions how God raised up a remnant. The modern equivalent of God raising up a remnant is the Tea Party movement; no leader, no figure head and no single governing organization. The Tea Party is simple We The People; individuals following their gifts and passions to turn our country around back to the principles and values which have made her GREAT! The left is in panic mode to counter the Tea Party. Because their philosophy is so flawed, they can not win on it's merit. Thus, the left must resort to lies and ginning up class envy and racial hatred. Totally despicable. I will spend 9/11 on Tea Party Express V national bus tour at our rally in Deltona, FL. With forces on both sides of the political aisle fighting to maintain the status quo; crony-ism, bigger government and even increasing out of control spending, the tea party is the last hope for America; God's remnant to save America and restore her to her former glory.